Water collected from the School buildings. Jinibara State School, Narangbah, Sunshine Coast recently erected a 5000m2 roof area over their sporting facility. This provided the opportunity to capture rainwater and utilise for the irrigation of the school sports fields. 7 x 46,400 litre rainwater polyethylene tanks were installed alongside the sports facility, giving a total storage capacity of 324,800 litres. 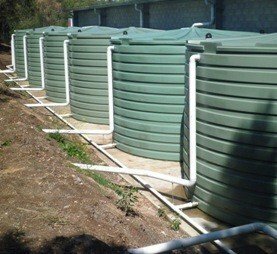 46,400 litre rainwater tanks using standard 50mm brass fittings.